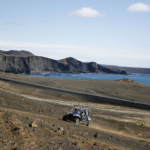 We will start the tour on the western part of Reykjanes peninsula and after around 3 hours of driving we will stop for lunch. 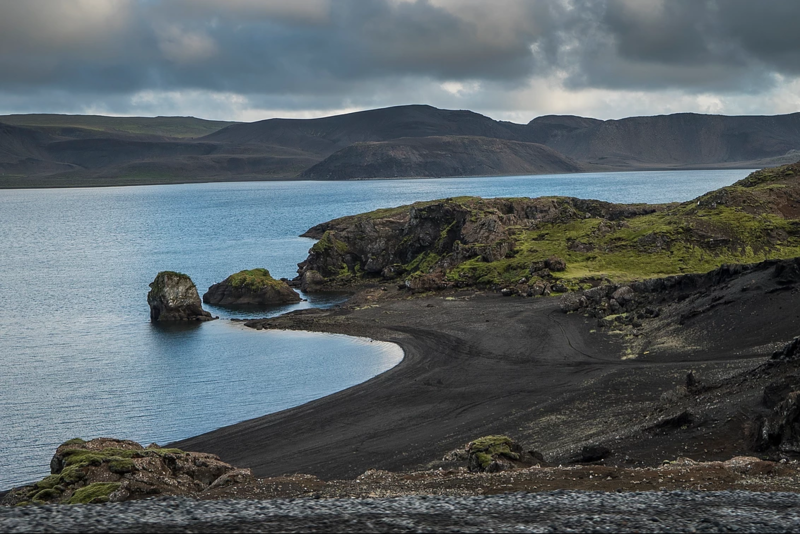 After lunch we head east to Krísuvík and drive along a road called “Vigdísarvellir” – a great route to experience the nature and the mountains around our in a new way. We stop on the way to take alook at the lake “Kleifarvatn” and also the thermal area called “Seltún”. 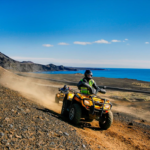 After the ATV tour we recommend you relax in the Blue Lagoon (admission to the Blue Lagoon not included). Send us an E-mail for more information. The tour starts at our base at 10:00 am. ISK 47,000 per person for two people on a bike. Add 12,900 ISK per person for a single bike. 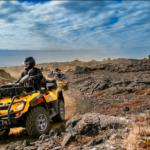 Includes: 6-7 hour ATV guided tour and lunch. Optional: Relax in the Blue Lagoon after the ATV tour. On this tour we’ll go through all kinds of terrain, we’ll start at our old harbor which is now a recreational area with dramatic shipwrecks and over hundred year old foundations that have remained unspoiled and protected for a reminder of the old life. We’ll drive through rocky mountain paths towards Mt.Thorbjorn, a dormant sleeping volcano that towers over the Blue lagoon. Our journey heads on to the one hundred craters of Eldvörp . If you are familiar with the Lord of the rings movies, you can say you’ve literally just entered Mordor. The area is full of volcanic craters and we’ll take a stop for a short hike to one of the them which has extensive thermal activity within and outside of the crater, where a great deal of steam of about 280´C escapes. 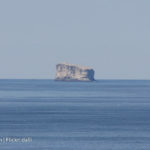 This area is mostly only known by locals making it a true hidden gem for the newcomer! 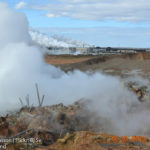 We’ll ride alongside the one hundred crater row towards our local hot spring area Gunnuhver exploited by steam vents and mud pools. The mud pools form where steam from boiling geothermal resevoir water emanates and condenses and mixes with surface water. Accompanying gases such as carbon dioxide and hydrogen sulphide make the water acid. This causes alteration of the fresh lava rock to clay. The ride continues towards the ocean to see the very cool rock formations of Valahnukar were there are often great deal of high waves offering spectacular views when waves break on the troll-stone looking rocks. 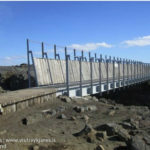 On that site you’ll also have a overlook to the volcanic island Eldey and the oldest lighthouse in Iceland. The fun is not over yet, our next path is through a vicious black lava field, a bumpy terrain and one of Game of Thrones film spots towards the black sandy beach Sandvík where Clint Eastwood filmed the award-winning movie Flags of our fathers based on the battle of japanese island of Iwo Jima during WW2. A very picture friendly spot and sometimes you can even see brave surfers riding the waves. By the beach there are mighty fun sand dunes and the guide will pick a cool track through them if everyone is up to the task. We’ll stop by beautiful lakes the area and enjoy the nature, You’re truly in the highlands over there, surrounded by mossy’n’black hills, there’s hardly no one ever there so you will feel tucked away in the wilderness away from any man-made disctraction. We’ll stop by the famous Seltún hot spring area were over time Here solfataras, fumaroles, mud pots and hot springs have formed, the soil is coloured bright yellow, red, and green hues. Sulphur deposits were mined in 1722 – 1728 and in the 19th century. German scientist Robert Bunsen visited the site in 1845 and, based on research there, proposed a hypothesis on formation of sulphuric acid in nature. Near the geothermal fields are several maars – craters created by the explosions of overheated groundwater! If you like to have fun and see cool things while doing it, this tour will not dissapoint!